Welcome to Craw County, Alabama. If you like your football muddy, your BBQ greasy, and your town rampant with vengeful, violent folk, then kick off your boots and sit a spell ‘cause we reckon you're gonna fit right in. 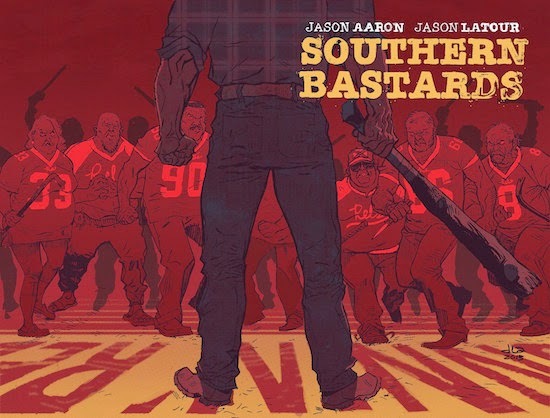 Good old boys, Jason Aaron and Jason Latour, head Down South to write and draw what they know in their pulpy, grim tale of crime, drugs and greed. Southern Bastards is the story of one man hell-bent on setting things right in his hometown some 40-years after he left it to rot, armed with only a big stick and righteous indignation fueled by family tragedy and the death of an innocent friend. What do you think of the recurring one-man vigilante theme across Aaron’s titles (Scapled, Punisher MAX, etc.)? Is he merely retreading old ground with Southern Bastards? Or does this series bring something new to the table? Was Latour’s art equal to both the quiet, emotional scenes and the more frenetic, violent scenes? Or was it more suited to one over the other? Did Southern Bastards portrayal of the American South seem one-sided and stereo-typical? Would you ever want to visit the South after reading this book? How menacing did you find the villain, Coach Boss? What did you think were his motivations for corrupting the football team to his own evil ends? What’s with the dearth of female characters? Did the end of the book shock or disappoint you?